Lance Mountain, Mike McGill, Rodney Mullen, Stacy Peralta, Steve Caballero, Tony Alva, Tony Hawk, Natas Kaupas and the list goes on. Heroes from the past and memories from a childhood of griptape and misplaced kickflip attempts. Skateboarding is a phenomenon that grew commercial during the 1980's, but still has kept a lot of its charm and characteristics (it might derive from a very low entry level). Today, skateboard has got its renaissance in the world of fashion, simultaneously as streetwear is as relevant as ever before. Esra Roise and Blender Agency have know each other for years, and have been wanting to do a project together for a long time. Up until this year, time and facilities had not been right, but in conjunction with the 10th Anniversary of Blender Agency, we finally got the chance to sit down and talk collaboration. Blender Agency wanted to create a few pieces from various producers to celebrate its 10th Anniversary, and it felt natural to ask Esra to be part of this. Esra grew up watching skate-movies and spend time in skateparks, with here elder brother and friends. Years later she got to work for a long time in an Oslo skateshop, and fast forward to 2014, she will be an official Element Eden advocate. Eden is the girl-team of Element, who supports girls who pursue art or other creative crafts. While discussing the possibilities for a collaboration, a skateboard deck was quickly established as a great platform to bridge the two parties. Besides Esra's background, the founders of Blender Agency grew up skateboarding, and among the very first brands Blender Agency represented was Vans of California; the essence of skateboard shoes (ref. Dogtown and the Z-Boys). 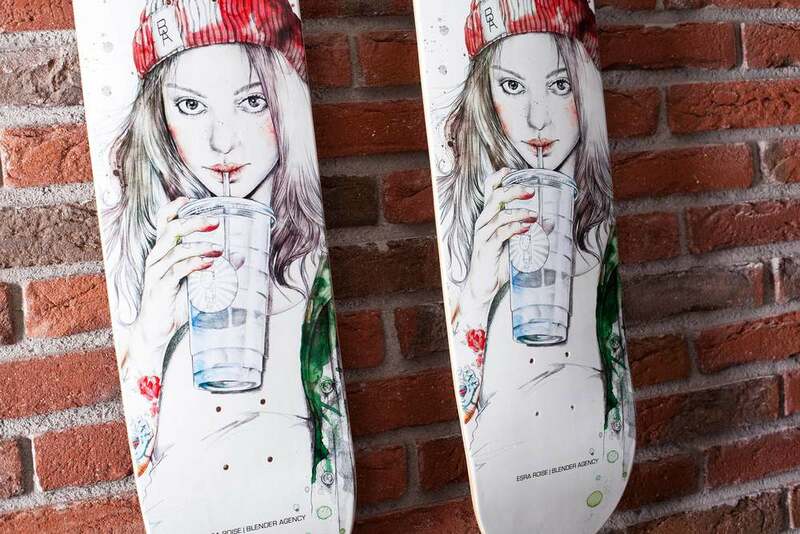 The result is an Esra Roise illustrated skateboard, made in an edition of 30 numbered and signed pieces. With the board follows a deck display, for the gain of your living room look. A limited number of decks is available here or through info@blenderagency.com. She finds inspiration in music, pop cultur, the fashion industry,imperfections and bad snapshot photography. Clients include VOGUE (China), Nylon magazine, Wallpaper*, Nike, VICE, Spin, Sundance Clearchannel, LEVI’S, Carl*s Cars, and more..
For more on Esra, please visit esraroise.com.